Hi, I used my new threading water punch to create the trim on this card. I know it's been around for years, but I finally managed to find it. I used a couple of green snippets and joined them together, the white strip is hiding the join nicely! I coloured 2 roses with tombows and a water pen, and cut part of one away to add some depth. The stamp is Fifth Avenue floral I think from Stampin Up (it's my sister's stamp). I'm going to link up to the challenge at Inkspirational where there's a sketch challenge. Since I used some snippets I'm visiting the playground at Pixie's Crafty Workshop. and Make It Monday where it's anything goes and to share creativity. 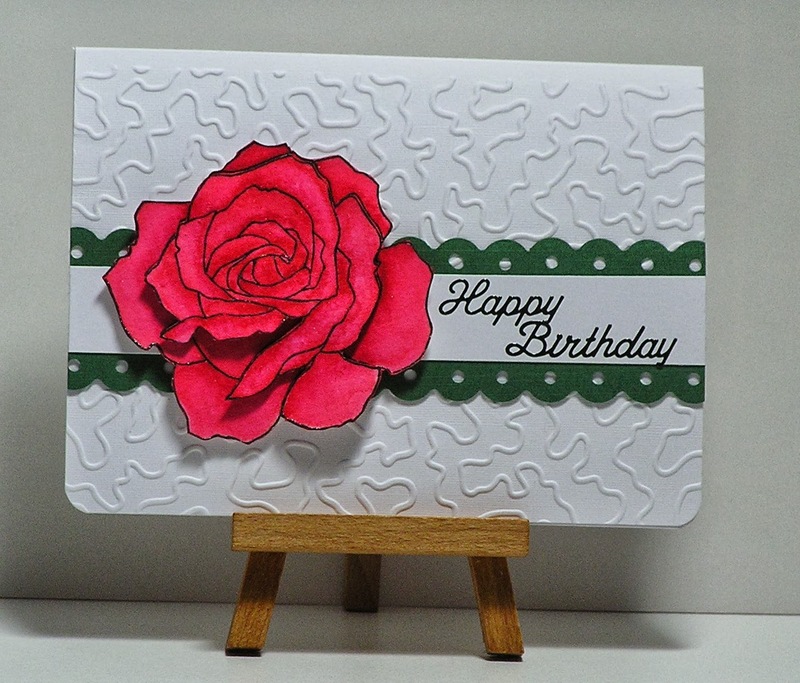 Gorgeous rose - beautiful shape and colour and perfect use of our sketch. Thank you for joining us at Inkspirational Challenges. Come back next week! Marina. This is gorgeous, Cathy! Love the color of the rose and it stands out beautifully from the embossed white background, A great take on the Inkspirational sketch! I spotted your card on MIM. That's a super sensational rose, Cathy! Well done, too, on having it fit so many challenges!! This is great Cathy! The embossing is so unique and that flower certainly demands attention! Beautiful work. Thanks so much for playing at Inkspirational! That rose sure pops out with the decoupage... Lovely card. Wow, what a pretty card design. Just popping by to thank you for sharing your project with us at Allsorts this week!